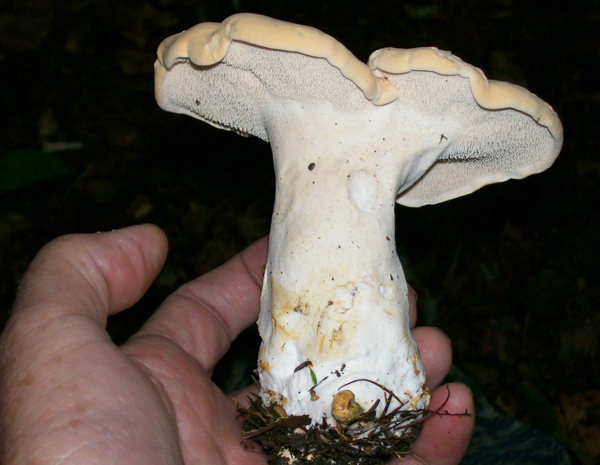 Hedgehog mushrooms are a great find. They are solid, there's very little waste, they clean real easy, they are not usually attacked by mushroom fly larvae as other mushrooms AND they taste great. We have a couple of different varieties here in southwestern Pennsylvania worth searching for. These smaller Hedgehogs start to make their appearance near the end of the season of the larger variety. I usually find the larger Hedgehogs ( Dentinum repandum ) from July to mid September. Around mid September these little Hedgehogs will start showing up and will be seen more often as the season progresses. 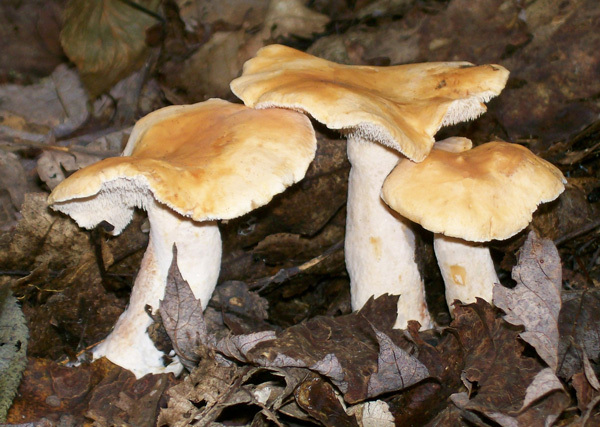 I find them in mixed hardwoods along woods trails / logging roads in moss or leaf litter. Many field guides say they grow in coniferous woods. Some guides say they are mycorrhizal ( meaning they have a symbiotic relationship with certain tree roots ) but I have found these growing in rotted hardwood and deep leaf litter so their habitat is a bit varied. One thing that I have definitely found over the years is that you will not find pounds upon pounds of the Little Hedgehogs like their bigger cousin. They are a definite MOO ( mushroom of opportunity ). Pick them when accidentally stumbled upon while searching for other mushroms. One reason you won't find oodles of these ( unless you're in the Pacific Northwest ) is because they are small mushrooms. Compare this regular sized Hedgehog in the photo below ( which by-the-way weighed in at 13 ounces ) with those in my palm in the first photograph of this article ( which collectively weighed in at 3 ounces ) and you can see the difference. Another possible reason why great quantities of the Little Sweet Tooth is not found is because they grow in approximately the same season as Sheep's Head mushrooms and King Boletes of various ilk and therefore more of my time is spent searching and picking the latter. And finally, oftentimes the leaves have started falling covering these little ones when otherwise they would have been spotted. 1. Cap color is generally a shade of orange. Sometimes like the color of a faded hunter's outfit. As it matures the color lightens a bit. 2. The spines under the cap are similar to the larger variety however they have the appearance of being bigger in proportion to cap size than the spines of the larger variety are in relation to their caps. Stubbier? 3. 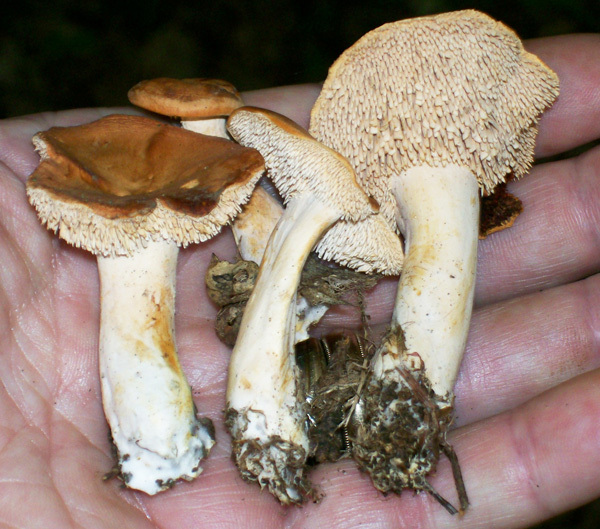 The caps also appear to be more like regular mushrooms, that is, because the stems are not usually off-center as the larger variety you will often be fooled and bend over to pick one and discover that it is not what you want but some small Lactarius or Russula. Taste is similar to the golden chanterelle. If you like chanterelles you will love these. Dentinum umbilicatum - A/K/A - Hedgehog, Sweet Tooth, Little Hedgehog, Little Sweet Tooth. DATE - Mid September to November, depending on weather. FOUND - Boggy pine duff and leaf litter of hardwoods. Laurel Hill State Park, Kooser State Park and Forbes State Forest. After several damp days in the Fall is the best time.